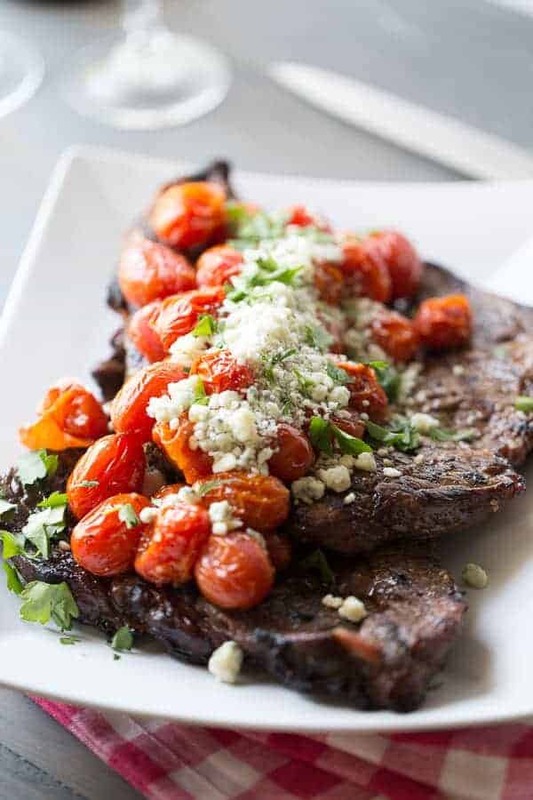 Grilled sirloin steak is lightly seasoned and topped with roasted tomatoes and blue cheese! Did you have a lovely Easter? How much Easter candy did you eat? Now, how much did you eat when your kids weren’t looking???? I’ll be honest, I kept a whole bag of the flavored Tootsie Rolls just for myself. My original intention was to put some into the Easter baskets but darn it, they just didn’t make it. I don’t feel guilty about that either. I could go on about candy, but that’s not what I want to write about today. We did not have a big to-do for Easter. My extended family could not come together. So we’ll celebrate this Sunday instead. Since Sunday was a holiday, I felt compelled to come up with a “fancy” dinner for the five of us. We deserve special meals too right?? A few days ago, my mom had given me two pints of cherry tomatoes. They were deeply discounted at a produce store. My mom is a professional discount shopper. She is retired and has time to frequent every grocery store in a 25-mile radius!!! That’s a post for another day. As I was saying, I was given these tomatoes. I was tired of salads. My kids do snack on them, but that’s hit or miss. So what to do???? Here’s the “fancy” part. I decided to roast them. Couldn’t be hard right? Guess what? It wasn’t. It was insanely easy and 100% flavorful! I thought they’d be excellent as a steak topping along with some crumbled blue cheese. Since I was roasting tomatoes, on another sheet pan, I threw together some diced potatoes and cauliflower tossed with olive oil, parmesan cheese, salt, and pepper. This meal came together beautifully. Everyone asked for seconds. Even my 3-year-old! Ok, so she hadn’t eaten any lunch (don’t judge me) and was extremely hungry!! But everyone agreed it was a good meal. Good enough to share with friends like you. Right before bed, my 3-year-old gave me kisses and wished me a happy Easter. She asked if the next time we have a fancy meal will it be Easter time? I thought that was precious. Or was she insulting me? Perhaps, to her, my everyday meals are ordinary and bland? Perhaps I’m not giving her taste buds enough credit? Perhaps I’m over thinking this? 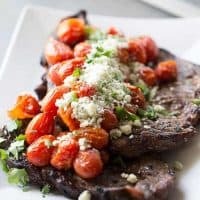 Regardless, this grilled sirloin steak and roasted tomatoes seems fancy, but is easy and tastes amazing. This meal will impress your friends, your dinner guests, and yes, your own family. You will be a rockstar. Loving this steak recipe? Then try these fun Fusion Grilled Steak Tacos or for special occasions, this Steak and Shrimp with Champagne Cream Sauce! 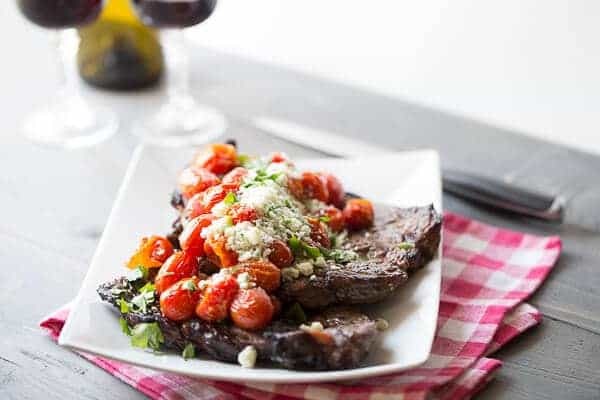 Marinated steak is cooked until desired doneness then topped with roasted tomatoes and creamy blue cheese. Combine marinade ingredients in a large ziplock bag, add your steak. Marinate two hours. Pre-heat oven to 400. 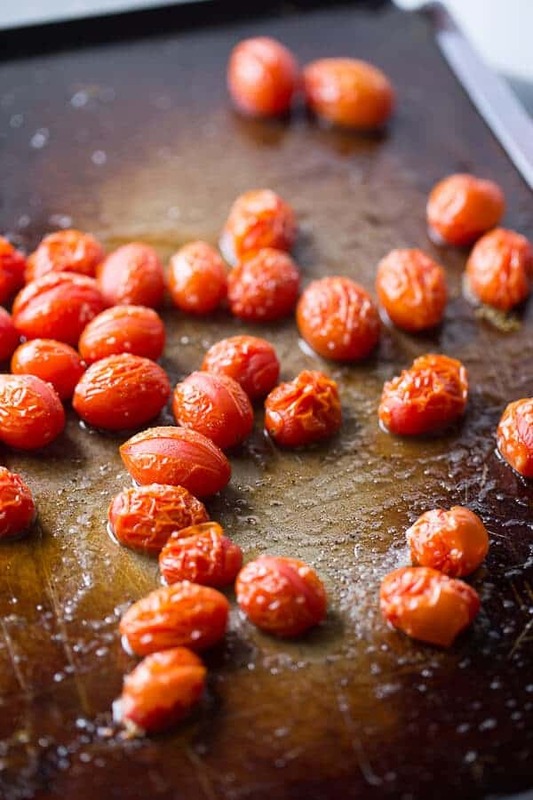 Lay your tomatoes on a foil-lined baking sheet in one layer. Drizzle olive oil over the tomatoes. Sprinkle garlic, salt and pepper over the olive oil. The seasonings can be completely adjusted to your tastes. Roast in the oven for 20 minutes. Meanwhile, grill steak on a preheated grill for 5-6 minutes per sided depending on your desired degree of doneness and the thickness of your steak. Be sure to allow your steak to rest for about 10 minutes prior to cutting so that your juices can redistribute. 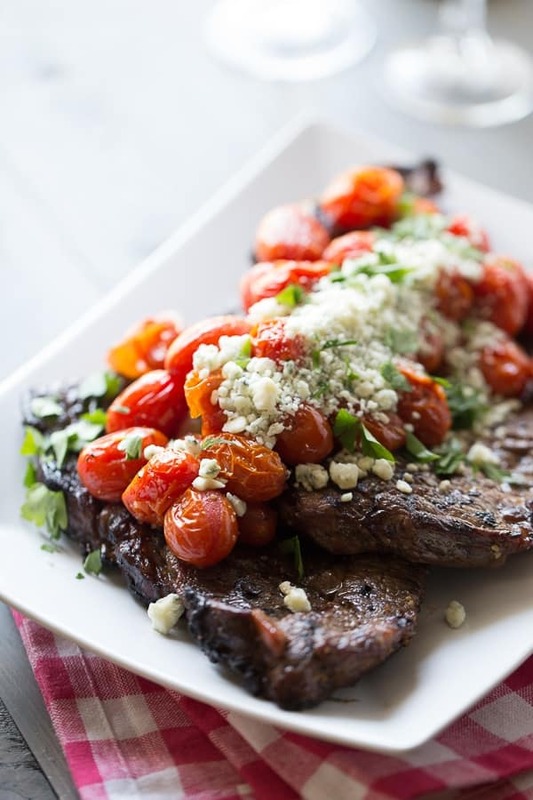 Top your steak with your tomatoes and crumbled Bleu Cheese.